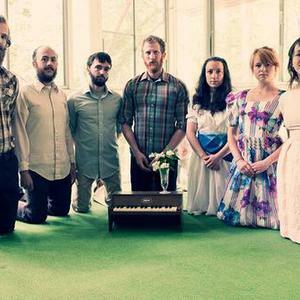 Lost in the Trees is a folk orchestra from Chapel Hill, NC, led by composer and songwriter Ari Picker. Initially a bedroom recording project, Lost in the Trees has grown from a solo effort to a full symphonic band, sometimes numbering over a dozen members. After releasing his self-titled album on Trekky Records, Ari attended the prestigious Berklee School of Music in Boston, MA, further immersing himself in the historic realm of classical composition. While in Boston, Ari assembled a small group of players to help him record Time Taunts Me , an EP of giant orchestral pop songs, released in 2007 on Trekky Records. The short album received some generous acclaim from national critics, but as Ari hurried to finish school, he was unable to tour in support of the music. After finally moving back to North Carolina, Ari began writing a new album and assembling a cast of musicians from the Trekky Records Collective and the University of North Carolina Orchestra program. Now with a vast and supportive team behind him, Ari was able to complete his most affecting and powerful album to date, All Alone in an Empty House . The album was released in a single three-format package in September of 2008, containing a vinyl record, a CD and an MP3 download. The compositions benefited from a dedicated live backing band, complete with full string section, horn section, accordion, mandolin, glockenspiels and more. In February 2010, Lost in the Trees signed to Los Angeles based Anti- Records, who will be releasing a new and enhanced version of All Alone In An Empty House, which has been reworked by acclaimed North Carolina producer Scott Solter (The Mountain Goats, Spoon, St. Vincent). The new album will be released worldwide in August, 2010. Trekky Records will release a new, LP version of Time Taunts Me on vinyl in early 2011. Fans of the EP will be treated to remastered versions of the original songs, as well as new unreleased songs that turn this little EP into a big old LP.